Well, the epic vacation that was two years in the making has ended. I had intended to post as we went but there were some extenuating circumstances prohibiting that. One was Internet access. Sometimes it was great, sometimes it wasn’t. Another factor was school work. I had to make sure I got that submitted when I did have Internet access. And the final factor was the Great Tire Blow Out of 2013. So here’s part one of the Cowboy Hunting Story: The day Johnny Cash died. This is Johnny’s wheel, after the tire blew out on the highway. This thing set off a chain of events we’ve been dealing with for 11 days now. Meet Johnny Cash. He’s a black Hyundai Elantra we barely got to know before he was snuffed out. And by that I mean his tire blew on I-90W in Montana the second day we drove him. It was an epic blow out. One minute everything is fine, the next minute the car is shaking and I see the tire go flying away from the car in the side view. Panic set in when the brakes didn’t respond and we ended up using the emergency brake to stop on the shoulder. We held it together long enough to call Alamo’s roadside assistance request help. Trouble was, little did we know that a blown tire was going to rob us of a day and then take another 11 days to clear up with Alamo. I’ll give you the short version of a very long story. (The short version is still too long, I’ll warn ya.) We called Alamo, gave them our location, almost to the mile marker – quite a feat in a rural area without much to tell us where we were. 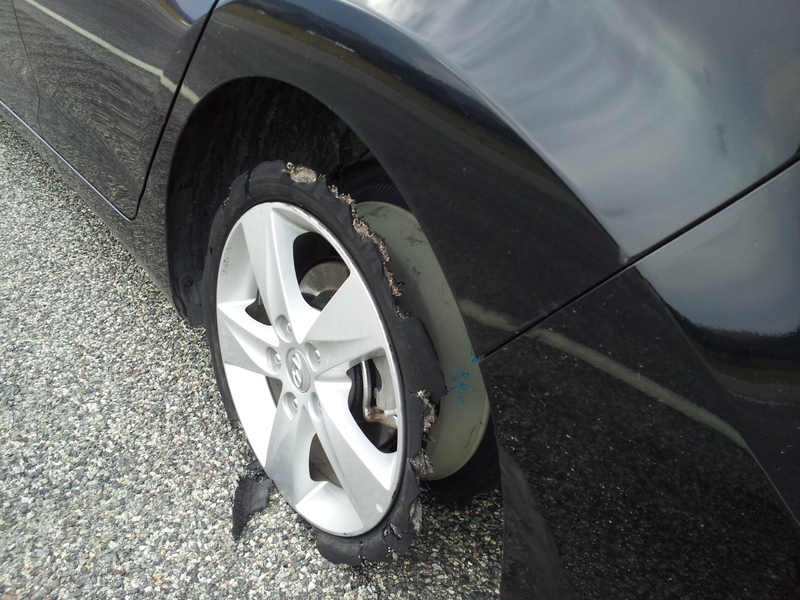 We told them we didn’t have a spare in the trunk – just a can of fix a flat and an air pump. As you can see in the photo, the only thing left flat was the rim. About 30 minutes later, I get a call from someone else in Roadside. She says that they don’t have a highway number in the request. Funny, because I’d gone over it with the first person. That’s when I started taking notes. Mike from All-Star Towing in Laurel, Mont., showed up around 6 p.m., while it was still raining. He cheerily notified us he was there for a tire change, and seemed genuinely confused when I explained that we didn’t have a spare, and Alamo was aware of this in the first conversation. He stayed with us until I called Alamo back, and again requested a tow for the car. He left us with his card and told us to call if we needed anything. We ❤ Mike. I’ll get to why later. He left us around 6:15 p.m. For the next two hours, we watched a storm pass, saw a rainbow and viewed our first Montana sunset over the distant mountains. We had a great view in the car. But its kind of hard to enjoy natural beauty when you’re about to lose it. Montana dark isn’t like Cincinnati dark. Here, we have street lights and people constantly moving around. There, when the sun sets the only light you have is the moon and what you bring with you. And that’s terrifying when you ain’t from around them there parts. Plus, I spent most of that time calling about six different people with Alamo and Enterprise, Alamo’s parent company, and either I was told there was a tow truck ordered or I was told something like, “I think there was one ordered. Let me check.” Then I would sit on hold until either the call dropped or someone else called me. Service isn’t great between two rock formations in the middle of nowhere. Salvation came in the form of Mike sending his girlfriend, Tina, to come pick us up. (This is why we ❤ Mike.) He called us around 8 p.m. and told us that she was on her way. I cried tears of joy, and I’m so not a crier. Then Alamo called me and said they found someone to pick me up (SO not true) and advised me to leave the keys in the unlocked car. I was going to take the keys, but I did what I was told. I even tried to find out what hotel they wanted me to go to, but no one could give me an answer before Tina arrived. We also ❤ Tina. Around 9 p.m. we checked into a hotel in Laurel, Mont., and that’s when I finally get the automated call from Alamo. They ordered us a tow truck and it would arrive in 70 minutes. I was too exhausted and glad to be off the highway to even be annoyed anymore. It was four-and-a-half hours from my first call and three and a half from my second call before they finally ordered a tow truck. Once we got settled in (and I ate half a pizza), I tried calling back to see when we’d have working wheels. Apparently every rental car in the state was taken. I guess they don’t keep many around. Once I realized that I was banging my head against the wall, I tried talking to the manager of the Denver Alamo office, where we picked up the car,about getting refunded for all the extra expenses we were racking up. He wasn’t exactly helpful that first time I spoke to him. I was told to bring receipts to his office at the end of our trip and he’d “see what he can do.” Then he interrogated me about why I left the keys in the car. As if it was going anywhere. I called it a night around 11 p.m., not long after I got a call from Alamo asking me if the car was picked up. It was six-and-a-half hours after my first call for help. I assume that’s about when the car was picked up; obviously I don’t know the exact time because I wasn’t there. The next morning we had issues with someone finding a replacement car. First, the Enterprise concierge who was trying to help us didn’t believe the front desk clerk that there was only one taxi service in a town of about 7,000, so she spent a half an hour trying to shop around. (Really? How hard is that to believe? Its a small town!) Once we finally got to the Billings airport (the same place that had no cars for us the night before), the clerks at the Alamo desk had no idea what we were talking about. And they had no cars. They said they should have a minivan available sometime but they didn’t know when. Remember the storm we sat through on the highway? Well, it flooded parts of Billings and covered the entire city in mud, compliments of “the rims” as our taxi driver explained to us. When Billings gets a bad storm, the sandstone formations surrounding the city erode quickly and the dust in the air turns to mud from the rain, coating Montana’s biggest city in a layer of mud. So everything had to be cleaned. Honestly, I’m still not clear if the van had even been returned to Alamo yet. We camped out on the airport floor for a minute and reflected. I’m not usually the type to let myself be a victim and I never let myself get into a position where I’m at the mercy of someone else. But that’s exactly where we found ourselves. We were stuck in a city “a long way from home” as every Montanan we met was quick to point out. So why was super-independent, take-no-prisoners me sitting on an airport floor waiting for a minivan I wasn’t even sure was coming from a company who didn’t seem to care whether or not I was safe or not? Lacey and I took matters into our own hands and we were out of the airport in 30 minutes. I started going from counter to counter with the rental car agencies and Avis had mercy on us. The clerks were awesome and when they offered us a car, I about cried tears of joy for the second time in 12 hours. We got the heck out of Billings and headed on our merry way to Glacier National Park. So we moved on with our trip, I went through hell but finally got my money back, and the second time I talked to the manager of the Denver office he had a completely different attitude. So, the moral of the story is, I won’t be using Hotwire anymore (they tried to offer me $25 credit on a future order instead of just refunding my car rental fee). Despite Alamo’s about-face this evening and the fact that they did (finally) make it right, I am not likely to rent from them again. If you ever decide to use either service, pack your boxing gloves. You’ll likely get everything squared away in the end, but you’ll need to be able to come out swinging to make it happen.